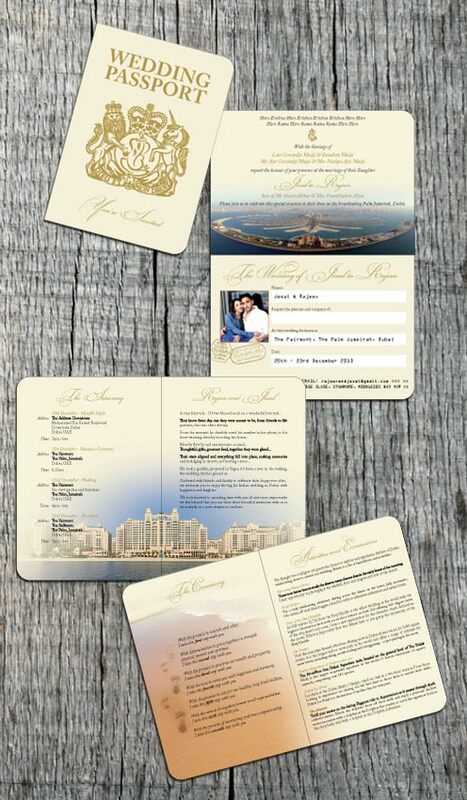 Jesal and Rajeev were looking to a Gold Wedding Invitation for their upcoming wedding in Dubai. A passport design sounded perfect and they decided to add some extra glamour by having the front and back cover foil blocked in gold. The result was stunning! Working with Jesal and Rajeev was great fun. 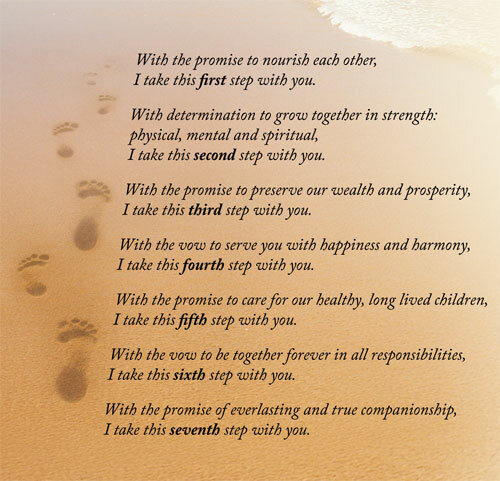 They had lots of ideas for what they'd like to include in their invitation which included the traditional Hindu wording for the 7 steps of marriage. The exact wording of this poem can very slightly but Jesal and Rajeev chose the below and included it on a page in their invitation. They also wanted to combine the traditional UK passport with an image of Ganesh to recognise their Hindu beliefs. I was able to incorporate an illustration of the Elephant God into the shield area of the UK passport. The finished result was really effective. For a finishing touch to their Gold Wedding Invitation I added monogram on the back cover. It looked gorgeous with their initials entwined along with their wedding date. Firstly we would like to thank Kate from the bottom of our hearts! You have created an invite so unbelievably unique, that not a single guest could stop talking about them! The quality and design was just so incredible and it is definitely one of those invites that our guests will keep forever! Thank you for your patience and understanding during the process of selecting and designing them. We would not have had this beautiful keepsake without you! We were also so impressed with your service, and we have already been asked by numerous guests your contact details which we will pass on as it was a pleasure working with you. The process of foil blocking is quite complicated which can make it costly. Not only are the pages of the invitation printed in the standard way, the cover is foil blocked using a die made to the specific design. The covers then go through a separate process in order for the foil to be added. My suppliers use an original Heidelberg cylinder which is the cream of the crop for this kind of process. 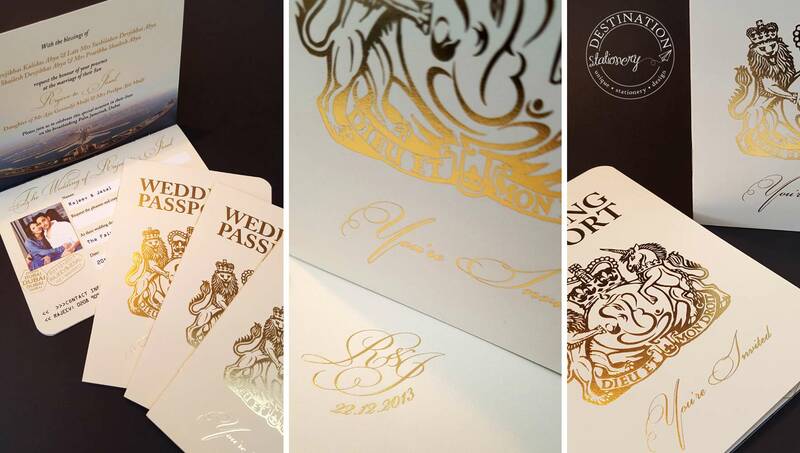 The option of foiling does add to the basic cost of the invites so it's certainly not everyone's wedding stationery budget but having said that if you're looking for some added glamour and elegance to your Gold Wedding Invitation or are having a Gold Theme Wedding it's the perfect option. Read more about Foil Blocking here or contact me if you have any questions or ideas you'd like to discuss. I'll be adding more examples Gold Wedding Invitations as I create them so be sure to check back soon or contact me for samples.